This method is the quickest way to roast spaghetti squash. It takes just 30 minutes to cook (compared to 1 hour or more when cooking whole or halves) and it creates perfectly spaghetti-like strands! Spaghetti squash! Are you a fan? I used to be take-it-or-leave it when it came to spaghetti squash, but the more I’ve tried it, the more I like it. I’ll NEVER try to convince you that it’s a direct substitute for real pasta – that would be a lie. It is, however, a healthy alternative to pasta and an awesome nutrition-packed veggie to add to your diet. The only problem with spaghetti squash is that it can take a really, really long time to cook. You could, of course, microwave it for quicker results. But we don’t have a microwave and I think the flavor of oven-roasted spaghetti squash is SO much better. Which is why we’re gonna talk about the quickest way to cook spaghetti squash in your oven. ‍♀️ That’s why you’re here today, right? Step 1 – Chop the squash in half lengthwise. Step 2 – Scrape out the seeds and guts. Step 3 – Place halves cut side down and slice horizontally. These slices should create half moons about 3/4″ to 1″ thick. 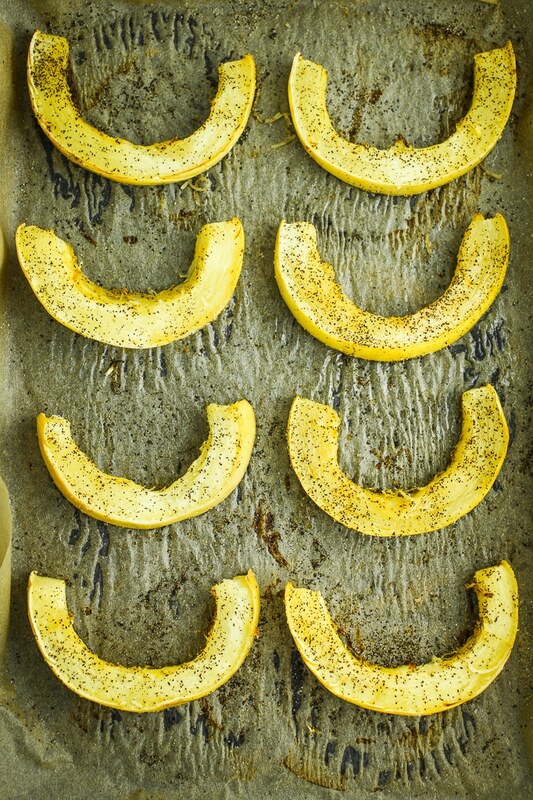 Step 4 – Arrange half moons on a baking sheet and spritz with olive oil or cooking spray of choice. Sprinkle with salt and pepper. 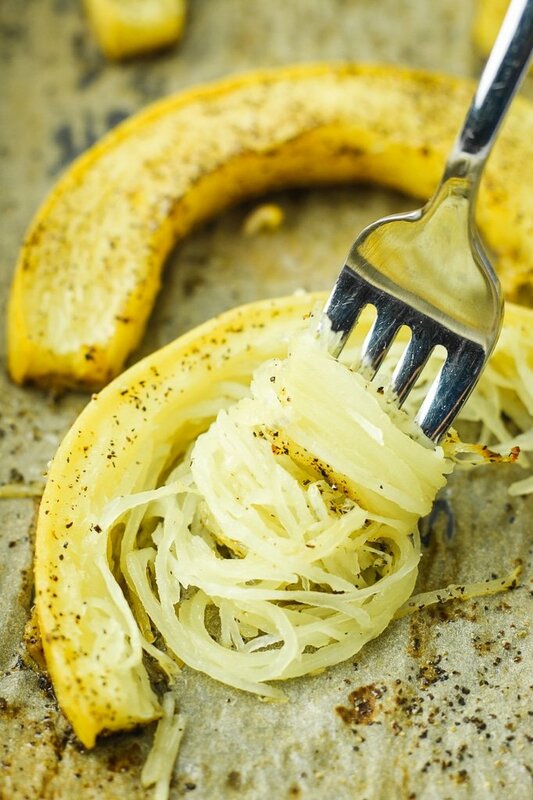 Step 5 – Bake 30 minutes, remove from oven, and use a fork to strip the “spaghetti” away from the squash rind. I could go on and on about all of the yummy ways to use this roasted spaghetti squash. The possibilities are endless! Do you have a favorite way to eat it? Drop your ideas in the comments below. And if you try this method for cooking spaghetti squash, show me on Instagram – tag us in your post so we can share it on our story! Preheat oven to 375º. Chop the squash in half lengthwise. Scrape out the seeds and guts. Place halves cut side down and slice horizontally. These slices should create half moons about 3/4″ to 1″ thick. 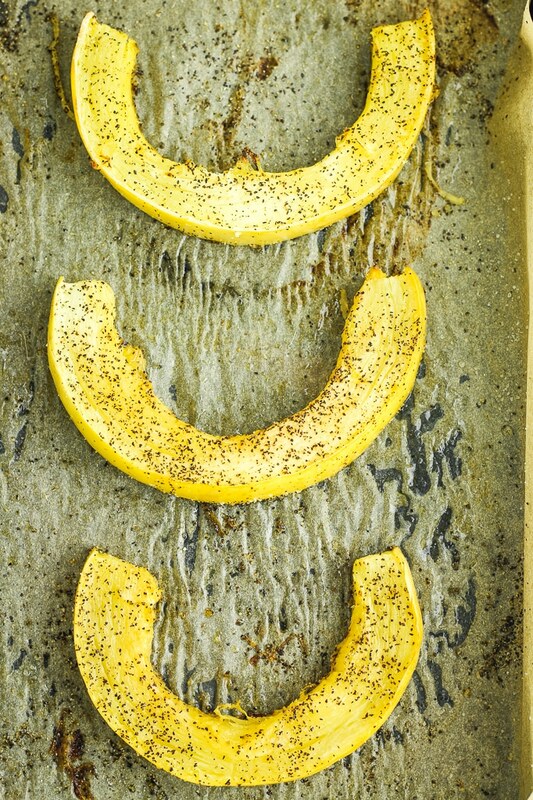 Arrange half moons on a parchment-lined baking sheet and spritz with olive oil or cooking spray of choice. Sprinkle with salt and pepper. Bake 30 minutes, remove from oven, and use a fork to strip the “spaghetti” away from the squash rind. 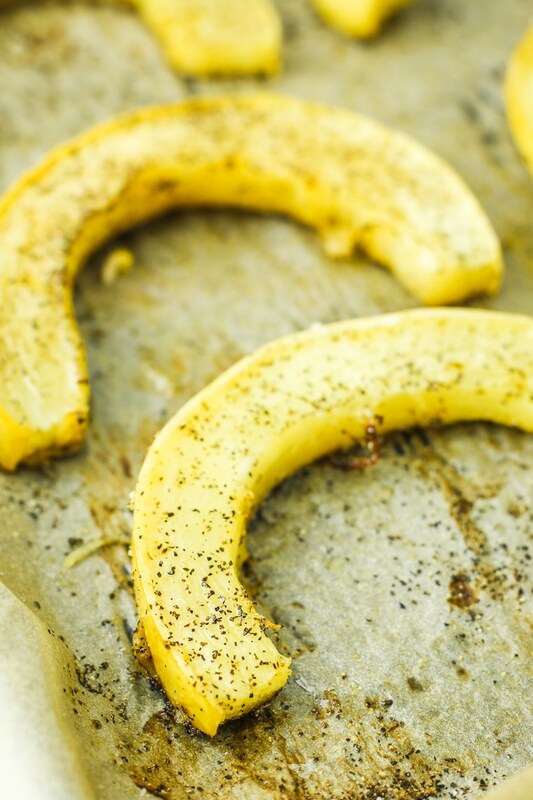 You can add any seasonings that you like to the squash before cooking. I like to add Italian seasoning, garlic, cayenne, chipotle, etc. depending on what I’ll be using the spaghetti squash for.